Pixar released its first feature-length film, Toy Story, way back in 1995. In 2015, they’ve already released Inside Out, and by the end of the year, they will have also released The Good Dinosaur, which will mark the first time they’ve released two features in the same year. Who does that? Nobody. Not ever, unless you’re named Pixar. Somehow, they have art down to a science. 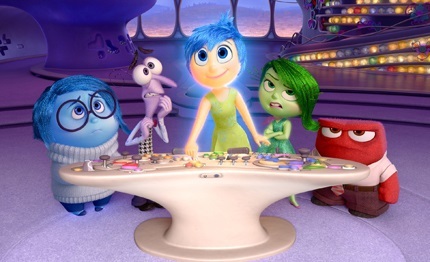 So you should not be surprised to learn, then, that their latest experiment, Inside Out, is also brilliant. And part of its brilliance is its ability to appeal to kids and adults simultaneously, but on very different levels. Sure, there’s a lot of funny stuff going on, and the animation is certainly wonderful throughout. But the subject matter isn’t really geared at youngsters, although they will, no doubt, enjoy it just the same. The film cleverly gives us a peek inside a human being’s head, and allows us to see why a person responds in a given situation as they do. It seems there is a command center, of sorts, with a rather elaborate system of managing short and long term memories, and where a team of emotions compels the person to respond to, well, everything. Joy, Anger, Sadness, Fear, and Disgust have ongoing debates over how the person should react, and they invoke certain memories to justify their positions. In the case of our story, our heroine is an 11-year-old girl named Riley (Kaitlyn Dias), and she is moving to San Francisco from Minnesota with her mom and dad, because he’s starting a new company. This is a tough move for Riley, whose whole life is back in Minnesota with her old school, all her friends, and her passion, hockey. As Riley tries to adjust and fit in to her new surroundings, we see all the conflict that ensues in her own head, as well as the occasional peek into her parents’ heads, as well. For Riley, Joy (Amy Poehler) has been, up to this point in her life, very much in charge of how things go down at headquarters. Although there is regular disagreement amongst the other emotions, Joy typically keeps things under control to ensure that Riley is always happy. But as she transitions toward teenagedom, hormones and circumstance and change collide in ways she’s never had to deal with, and Joy’s control begins to spin wildly out of control. Until now, Joy has kept Sadness (Phyllis Smith) mostly out of the way and doesn’t let her touch any of the core memories that help make Riley who she is. But when Sadness does touch one at a critical moment, things start unravelling quickly. It is a bit difficult to explain much without explaining too much, but it’s worth the hour and a half to find out for yourself just how insightful and thoughtful Inside Out really is, all while being full of fun, as well. I think one of the things that struck me was that this was a great starting point for having a conversation with your kids about the misconception that all kids (and many adults) have that life is all about being happy all the time, and avoiding sadness and disappointment like the plague. The fact is, what makes joy so blissful is that it is always tempered with sadness. One provides perspective for the other. And while our natural tendency is to seek after things that make us happy, sadness and disappointment are also part of nature’s plan. It reminds us of the reality that there is opposition in all things, and that simply trying to avoid sadness is impossible and, ultimately, undesirable. In fact, most of our lives (and therefore most of our memories) are rather messy amalgamations of good times and bad, joy and sadness, peace and anxiety, all mixed up in the blender of mortality. So whether or not the trailer for Inside Out made you feel like you needed to rush right out and watch it, statistically speaking, it’s pretty much guaranteed to be well worth your time. Plus, it’s beautiful, and very funny, and the whole family should find something (probably somethings) to really enjoy. And, for most of us, seeing what those little voices inside our heads look like is both amusing and revelatory, as we confront the whimsical reality of the constant struggle we have to keep our emotions in check, even as we hope for the best but slog through the worst. It reminded me, too, of how different my perception as a parent may often be from my children’s. I’m still surprised sometimes by the things my kids remember and cherish from our collective familial experiences that seemed to me, at the time, as disasters or disappointments. They love things that didn’t work as planned, they reminisce about ruined events, and they laugh about things that often involved somebody crying. Life isn’t neat and tidy, emotionally speaking. It’s a mess of memories and feelings that make us who we are, individually and collectively. So sure, Inside Out is just a cartoon. But the truth has a way of showing up in the strangest of places, maybe even in the little voices inside your head.